Heygates Horse Feeds are made using a blend of traditional raw materials and modern technology resulting in the best possible quality and value for money. Unlike many competitors’ products, Heygates coarse mixtures use traditional cooked flaked cereals. The whole grains are cleaned then cooked and rolled. This process makes the energy from the grains more easily available to the horse’s digestive system and helps to make the feed non heating while still providing valuable nutrients. 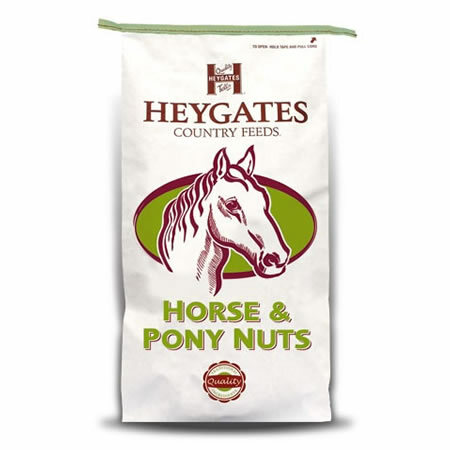 Heygates horse feeds are based on fresh bran products from Heygates’ own flour mills and are fortified with the ideal balance of protein, vitamins, minerals and trace elements. When the Heygates flour millers make fine bran for the horse feeds they put the wheatgerm in as well so your Heygates horse feeds are full of natural wheatgerm goodness. Please call: 0114 288 2465 for further info & prices. Take a close look at the ingredients used to make Horse & Pony NutsA non heating high fibre ration based on fresh bran products from the Heygates flour mills fortified with minerals and vitamins. Horse and pony nuts are a safe non heating diet for all horses and ponies at rest or in light to moderate work. A low starch, low intake, nutrient dense balancer for all horses and ponies, particularly those requiring a calorie controlled diet. Equi Balancer is ideal for good doers, overweight horses and ponies and those prone to laminitis. 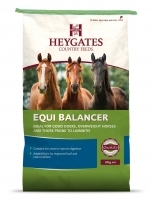 Equi Balancer is high in Omega 3 fatty acids from linseed, it contains a live yeast supplement for improved digestion and has added biotin for improved hoof and coat condition. Meadow Blend contains the same quality raw materials as Traditional Blend but with added herbs, garlic and live yeast. Yeast has been shown to improve fibre digestion and mineral uptake as well as improving hoof and coat condition. Meadow Blend is suitable for all horses and ponies in light to moderate work or at rest. Challenger is a high energy coarse mixture for horses and ponies in hard work and competition, including eventing, show jumping, hunting and endurance. The high energy level is supplied from both cereal (carbohydrate) and oil sources for balanced safe nutrition. The daily feeding rate should be between 0.6 and 1.1 kg per 100kg of body weight in medium work rising to between 1.2 and 1.5kg per 100kg body weight for a horse in hard work. The actual rate should depend upon body condition, rate of work and temperament. 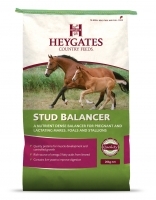 Stud Balancer is a low calorie, low starch, nutrient dense stud balancer for pregnant and lactating mares, stallions and foals over 3 months of age. It is ideal for horses prone to weight gain. A live yeast supplement is included for improved digestion and linseed provides a rich source of Omega 3 fatty acids to support immune function, fertility and a healthy coat. Balanced vitamins, minerals and trace elements support skeletal and tissue development as well as immune function. A superior quality coarse mixture for the older horse. Twilight Years is balanced for protein, energy, minerals and vitamins to supply the particular nutritional requirements of the older animal. Traditional flaked barley which is steam cooked for improved palatability and digestibility. Steam cooked flaked barley is a key raw material in Heygates coarse mixtures and is ideal for providing weight gain and condition. Freshly milled wheat bran from Heygates own flour mills.